Organizations like UN FAO promote IPM as the preferred approach to crop protection and regards it as a pillar of both sustainable intensification of crop production and pesticide risk reduction. As such, IPM is being mainstreamed in FAO activities involving crop production and protection. Most groups focused on combatting FAW (FAO, USAID, CABI) are promoting an IPM approach. 1) Natural enemies or "farmers friends"
Fall Armyworm has many naturally-occuring ‘natural enemies’ or ‘farmers’ friends’. These biological control agents are organisms that feed on FAW. In the Americas, and probably in Africa, these natural enemies can be active during all development phases of FAW, i.e. in the egg, larval, pupal and adult stage. Natural enemies have the potential to substantially reduce the FAW populations and hence the damage caused by FAW. Their impact however depends on a number of factors including the diversity of organisms being active, their life-style, local presence, numerical and timely abundance, host specificity, agronomic practices, pest management methods etc. A major challenge is to create conditions to exploit the potential of these beneficial organisms to their full extent. Broad spectrum pesticides kill many of the farmers’ friends. It is important that farmers recognize the pest in all its development stages, its associated natural antagonists, identity possible gaps to be filled in local natural enemy guilds and at the same time sustain their action by adequate management measures in an IPM context. Biological control should be understood as an integral component of IPM and an important part of mutually compatible pest-suppressing methods aimed at generating higher profits whilst preserving the environment and human health. Biological control agents (BCAs) include the following: 1) predatory insects and mites, which eat their prey; 2) parasitoids, which are insects with a free living adult stage and a larval stage that is parasitic on another insect; and 3) parasites and microbial pathogens, such as nematodes, fungi, bacteria, viruses and protozoa, which cause lethal infections. Parasitoids are organisms whose adults lay eggs inside or attached to a single host organism. For their development, the resultant larvae feed on the tissues of the host until they are fully grown and pupate. The larvae of parasitoids always kill their host as the outcome of their development. The majority of parasitoids known to be associated with the FAW are wasps, and less frequently flies. Species that have undergone an adaptation process to the FAW display a narrow host range. Such co-evolved parasitoids can exert a strong impact on populations of the fall armyworm and are thus good candidates for use in biological control programmes. During inventories in the Western Hemisphere, about 150 different parasitoid species were found to be associated with the FAW in various crops. Behavior: The species behaves as an egg parasitoid, i.e. females T. remus are attracted to FAW egg masses where they oviposit. Offspring of the parasitoid develop within eggs of FAW of which they then emerge as adults. Life cycle: over their lifetime females are able to parasitize some 120-130 FAW eggs. The development of immatures takes about 10 days at 280C and thus about 40 generations are produced per year. Importance: T. remus is reported to be highly effective in several South American countries with parasitism rates above 80 percent depending information sources. Identification: parasitoid of about 5 mm size characterized by a carapace-like abdomen. A white band medially divided can be observed at the base of the abdomen. Wings bear numerous veins. Antennae of both sexes are filiform and have 16 segments or more. Behavior: C. insularis is an ovo-larval parasitoid. Females oviposit in eggs of FAW but larvae start their development in later instars of the caterpillar. When mature, parasitoid larvae exit their host and build a silken cocoon to pupate. Life cycle: each female can parasitize about 600 FAW eggs. At 28-300C the parasitoid is able to develop within 20-22 days and females can live for about 12 days. Importance: C. insularis is the most common among FAW parasitoids in the Caribbean as well as in Central and South America. Identification: Male and female average 3 mm in length. While the head and thorax of adults are black, the abdomen is tan. The antennae are long segmented and slighter shorter than the body length. Females can be recognized by a very short ovipositor at the tip of the abdomen. Importance: C. marginiventris is less sensitive than other parasitoids in environments sprayed with chemical insecticides. It is adapted to subtropical and warm temperate areas. Attracted to host volatiles, it can persist at low FAW population densities using alternate hosts, thus it is a better competitor than Chelonus insularis. Identification: There are numerous species of the genus Trichogramma known to develop inside the eggs of the FAW and of many other Lepidoptera. Typically Trichogramma spp. are tiny wasps less than 0.5 mm long. Adults are mostly orange, brown or even black. Antennae are short, clubbed in females and hairy in males. Behavior: Adult females lay their eggs inside FAW eggs. Along with the larval development they gradually turn darker and are almost black when the parasitoids pupate. Adults emerge by chewing an exit hole on the FAW egg. Life cycle: The parasitoid completes its development in about 8 days at 280C. Females can parasitize up to 120 moth eggs and live for 6-7 days. Importance: In Latin America Trichogramma spp., in particular T. pretiosum and T. atopovirilia, are commonly mass-reared on alternative hosts in local mass production units and commercialized for inundative field releases. Identification: Several fly species of the family Tachinidae are able to develop on FAW caterpillars. Attacks by such parasitoids can be detected either when small maggots are visible in presence of FAW caterpillars, or tiny white eggs are observed on their skin. Alternatively fly pupae can be found nearby dead FAW larvae. Behavior: For species that lay directly several eggs on the skin of their host, parasitism starts immediately upon penetration of the maggot into its host. Other species await pupation of FAW to intensify their host feeding and complete their development. Despite frequent superparasitism, only a single fly develops per caterpillar. Life cycle: larvae Lespesia archippivora (Riley) completes their development within 13 to 17 days. Fly females can lay up to 204 eggs during their life time. Importance: About one third of parasitoids inventoried from the Americas belong to the family Tachinidae. While these often target several species of Lepidoptera attacking maize including other noctuids, they are also found on diverse host plants of the FAW. In Africa, because of the relatively recent introduction of the FAW on the African continent, data on native natural enemies are still very scanty. First field data demonstrate that a few parasitoids species have already accepted eggs and caterpillars of the FAW as a host. As these data are preliminary, it remains to be verified whether these natural enemies have shifted from African stemborers or earborers to the FAW, or if they represent new associations from other hosts. Two species are currently recognized to play a significant role as FAW egg predator in maize crops: Doru luteipes (Scudder) and Euborellia annulipes (Lucas). Both adults and larvae of ladybugs feed on various phytophagous insects such as mites, aphids, scales, mealybugs, eggs and young larvae of Lepidoptera including the Fall Armyworm. Coleomegilla maculata DeGeer, Cycloneda sanguinea (Linnaeus), Hippodamia convergens Guérin MenevilIe, Eriopis connexa Mulsant, Olla v-nigrum Mulsant, Harmonia axyridis (Pallas) and Neda conjugata (Mulsant) are species commonly found in maize fields in the Americas. Many carabid beetle species occurring in maize cropping are known for their predatory habits both as larvae or adults. Calosoma granulatum Perty has been observed to feed on young FAW caterpillars. There are several species of bugs that have been observed to feed on immatures of the FAW. 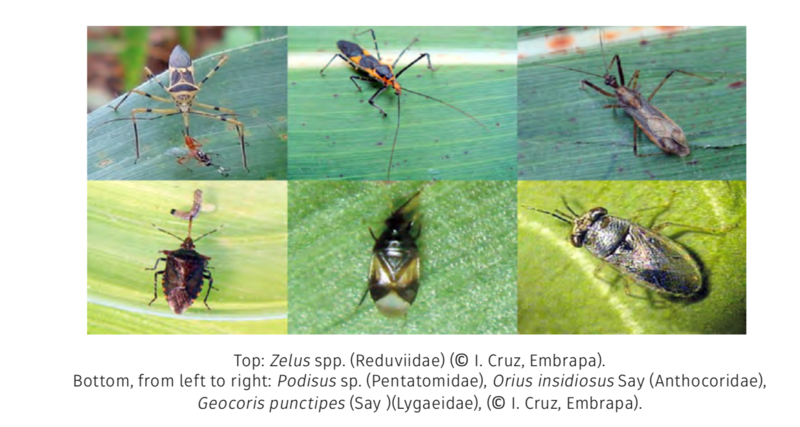 The best known of this category belong to the genera Zelus (Reduviidae), Podisus (Pentatomidae), Nabis (Nabidae), Geocoris (Lygaeidae), Orius and Anthocoris (Anthocoridae). Eusocial, solitary and other predatory wasps (Hymenoptera: Vespoidea) Ants (Hymenoptera: Formicidae). Ants are often among the most important predators of FAW larvae and pupae. Perfecto (1980) studied the interactions among ants, FAW and pesticides in maize systems in Nicaragua. She found that ants are very important predators of FAW in maize in Nicaragua and that pesticides dramatically reduced the presence and effectiveness of ants a natural biological control of FAW. She placed FAW pupae in the soil in maize fields and found that 92 percent of the pupae were removed within 4 days in fields without insecticide treatments, compared with only 4 percent in fields with insecticidal treatments. Ants have already been seen attacking and killing FAW larvae in maize fields in Africa. Some farmers have begun trying to apply lard or fish soup on their maize plants, to see if they can attract ants to their maize fields, so that they will then eat the FAW larvae present. Birds and bats have been observed to prey on FAW larvae. Studies in Central America have demonstrated significant impacts of birds on infestation levels of the FAW. Presence of trees or bird perches in or near fields will help attract birds who can prey on the FAW and help control their population. Despite their importance as natural antagonists, a thorough assessment for predatory wasps, ants and spiders is often neglected because of the difficulty to establish a methodology to accurately assess their impact. In Africa, though generalist predators such as ladybug beetles, earwigs, predatory bugs, eusocial- solitary- and other predatory wasps, ants and spiders are regularly observed in maize fields, a list of these natural enemies is yet not available. It is expected that for these major functional groups, forthcoming assessments will reveal many parallels between the pest’s area of origin and the newly invaded continent. Pathogens (microorganisms that can cause disease) are everywhere. In agriculture, plant pathogens (e.g. fungi, bacteria, viruses, nematodes) affect plants, reducing yield or quality. Also very important, but less perceived by farmers, are entomopathogens – those pathogens that affect insects (‘entomo-‘). Of these, the first three groups are the most common and will be mentioned here. In the Americas these pathogens are important as natural regulators of FAW populations. They have also already been observed killing FAW larvae in the field in Africa, so they are already present, at least in some farmers’ fields. The host-specificity of these pathogens is quite high, usually restricted to a few closely-related insect species. These pathogens do not affect other groups of insects (natural enemies), plants, animals or humans. FAW larvae naturally killed by viruses and fungi are easily identified in the field. Virus-killed larvae become soft and many hang from leaves, eventually oozing viroid particles and fluids (see photo ). Fungal- killed larvae turn rigid and appear “frozen” on the leaves, eventually turning white or light green, as the fungal spores mature. These are the two most common groups of entomopathogens naturally killing FAW larvae in the field. Farmers can learn to recognize these ‘farmer-friendly’ pathogens in the field. They can also multiply them locally. Farmers in the Americas sometimes collect the dead and dying larvae, full of viroid particles of fungal spores (the infective stages of the pathogens), grind them up in kitchen blenders. Then they strain the larval body parts out, mix the concentrated filtrate of virus or fungus with water, and spray them back out into the field, especially directly into maize plants currently infested with FAW. Entomopathogens can play a very important role in natural regulation of FAW populations in the field. Farmers should learn how to identify the different organisms, understand their biology and ecology, and begin to experiment with them! They are truly farmers’ friends! Management of Fall Armyworm (FAW) in maize fields begins with prevention. Planting dates: avoid late planting, and avoid staggered planting (i.e. planting of fields at different dates in the same area), as this would continue to provide the favored food of FAW locally (i.e. young maize plants). This is one of the most important recommendations for smallholders. In line with this, in January 2018 some FFS farmers in Kenya reported significant yield losses to FAW on late-planted maize plots, compared to adjacent plots which were planted earlier. See also the FFS Field Study in section B.4 on “Effects of planting dates on fall armyworm infestation and yield loss”. Good soil health and adequate moisture are critical: they are essential to grow healthy plants, which can better withstand pest infestation and damage. Also, unbalanced inorganic fertilization of maize (especially excessive nitrogen use) can increase oviposition by female FAW. See the Box in this section, and the FFS Field Study in section B.4 on “Effects of nitrogen fertilization rates and manure on levels of fall armyworm infestation and yield loss”. See references in Bibliography for training material proposing FFS activities on soil health. The efficacy of managing crop residues to break the life cycle of FAW generations is not well established by research. This practice is also time-consuming; it also runs counter other recommendations to maintain soil cover to improve soil health for sustainable production. Another very important aspect of prevention of FAW infestations is by maintaining plant diversity on farms. Even if many female moths are flying about, if she doesn’t lay her egg masses on maize plants, or if very young larvae don’t move onto maize plants, then the maize won’t be infested by FAW. FAW moths prefer maize to lay her eggs. In large monocultures of maize, she just flies about, laying her eggs in a sea of maize. she is more likely to move on, skipping maize plants which may be mixed in with the plants she doesn’t like. That, obviously is the first step in good FAW management – reduce oviposition on maize plants! Farmers in Central America have noticed that when they plant maize together with other crops such as beans and squash (their traditional “milpa” systems), they have less pest attacks. One possible explanation is that a diversity of plants in the same field confuses FAW, and it is difficult for it to find its preferred host plant (maize), eating less or laying fewer eggs. Another reason is that the female FAW moth doesn’t “like” certain plants because of the chemicals they emit. These volatile compounds are the “push” effect in push-pull systems, which “push” pest species away from certain plants while they are “pulled” to others because the plant chemicals make them more attractive (see section below on Push-Pull). So planting maize near other plants that “push” FAW moths away is the first step in preventing FAW infestation. A third possible explanation is that polycropping may provide natural enemies (parasitoids and predators) with resources such as nectar; water; or a place to hide, and those natural enemies will control FAW. We know that especially plants that bear flowers for a long pecriod of time, such as many “weeds” or some medicinal or plants used as condiments, do provide nectar to parasitoids and predators of FAW. In Mesoamerica, plants such as Tagetes lucida, Coriandrum, Sonchus olerace, Ruta and onions, attract beneficial insects. Trees are also important for pest management. Trees allow birds to perch, and many birds prey over larvae, such as the FAW. In Africa, many farmers are growing maize in agroforestry systems (MIAF). It could be important to document if the MIAF plots have less FAW attacks than maize grow in a monocrop. Push-pull is a habitat management strategy developed and implemented to manage pests such as stem borers, striga weed and address soil degradation, which are major constraints in maize production in Africa. The technology entails using a repellent intercrop (Desmodium as a “push”) and an attractive trap plant (Napier/Brachiaria grass as a “pull”). enriches the soil with nitrogen, preserves soil moisture and protects the soil from erosion. provide valuable biomass as fodder for livestock, which can translate into increases in dairy products like milk. Brachiaria grass grows fast with less water, and has been found to tolerate dry conditions better than Napier grass. Push–pull is an effective and efficient low-cost technology as it addresses some major constraints faced by smallholder farmers. The multiple benefits of this technology can result in an overall and significant improvement of farmer’s food security and livelihoods. Observations on FAW (S. frugiperda) by at least 250 farmers who had adopted the climate-smart Push-pull technology in drier areas of Kenya, Uganda and Tanzania indicated reduction of FAW larvae per plant and subsequent reduction in plant damage. Further surveys on climate-smart Push-pull and monocropped maize farms indicated 82.7 percent reduction in average number of larvae per plant and 86.7 percent reduction in plant damage per plot in climate-adapted push-pull compared to maize monocrop plots.